373 Commonwealth is located on the north side of Commonwealth, between Massachusetts Avenue and Charlesgate East, with 371 Commonwealth to the east and 375 Commonwealth to the west. 373 Commonwealth was designed by Mackay and Dunham, architects, and built in 1892-1893 by Mead, Mason & Co., building contractors, as a six story, 21 unit apartment house. 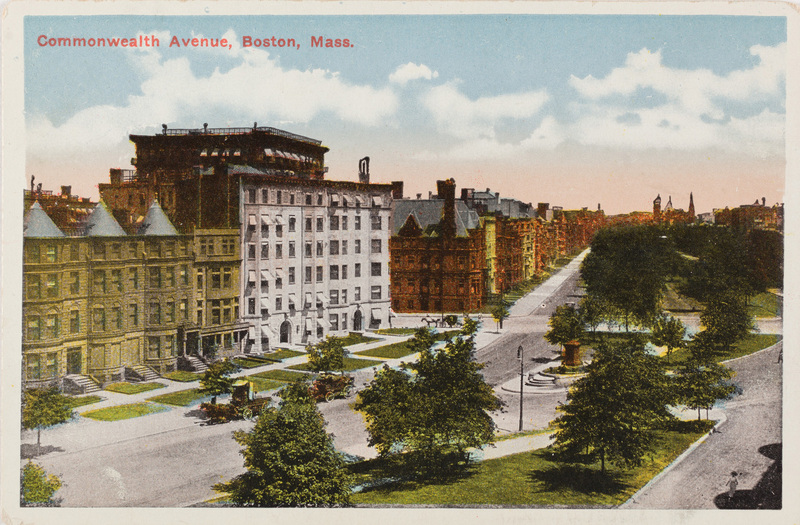 As originally laid out, the portion of Commonwealth between Massachusetts Avenue and Charlesgate East had a curved roadway intended to provide a transition from the formal design of the preceding blocks to the parklands in the Back Bay fens. It was divided into uneven islands and included a strip of green space in front of 371-387 Commonwealth and a small triangular island at the eastern end on which the statue of Leif Ericson (Erikson) was located (dedicated in 1887). 373 Commonwealth was named The Ericson or Hotel Ericson, presumably because of its proximity to the statue. However, not long after the building was completed, the Boston Board of Aldermen voted to remove the statue and re-install it in Wood Island Park in East Boston. According to a March 6, 1894, Boston Globe article, the Aldermen’s decision reflected the view that the statue “is not artistic and has become an eyesore to the dilettanti.” After significant public reaction, the Aldermen reversed their decision and the statue remained. 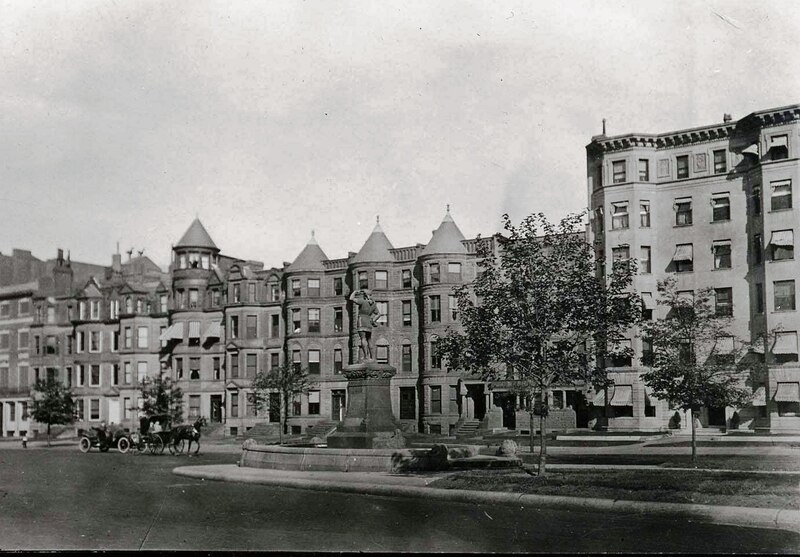 In 1917-1918, the roadway was straightened and widened, the central mall design of the previous blocks was extended to Charlesgate East, the green space in front of 371-387 Commonwealth eliminated, and the Ericson statue was relocated to the Charlesgate East end of the block. 373 Commonwealth was built for investment banker and broker Arthur Wilkinson Sawyer, attorney William Minard Richardson, and attorney Charles Edward Hellier, as trustees of the Ericson Hotel Trust. 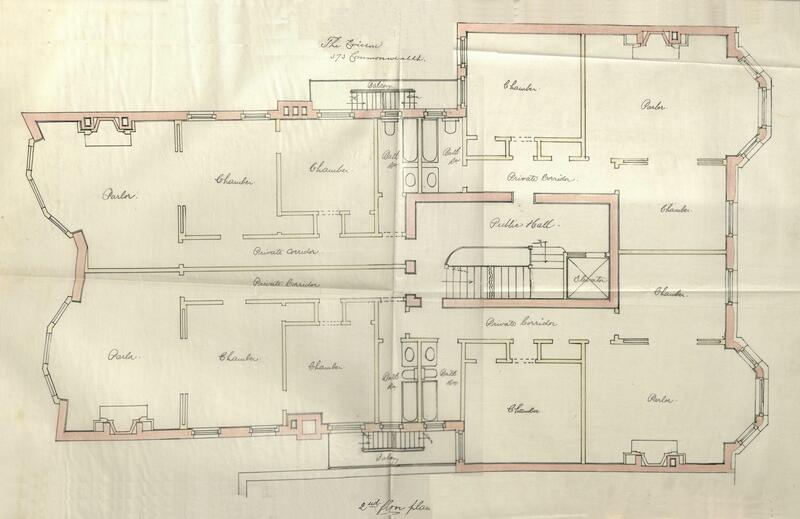 They are shown as the owners on the original building permit application, dated November 19, 1892, and on the final building inspection report, dated January 27, 1895. The beneficiaries of the Ericson Hotel Trust were the wives of the three trustees – Caroline (Carrie) Ann (Lodge) Sawyer, Sara Jenkins (Hanks) Richardson, and Mary (Harmon) Hellier – plus Robena (Robina/Ruby) (Mackay) Mackay, the wife of the building’s architect, Henry Squarebriggs MacKay. The land for 373 Commonwealth was the eastern 54.5 feet of an 80.5 foot lot purchased on December 23, 1890, by Arthur Sawyer’s wife, Carrie (Lodge) Sawyer. She had transferred the lot on April 29, 1891, to Sarah C. Bell, who conveyed the western 26 feet to Augustus F. Arnold on December 1, 1891, and the eastern 55.5 feet to the Ericson Hotel Trust on December 15, 1892. The land had been part of a larger parcel that Henry Lee, H. Hollis Hunnewell, and Augustus Lowell purchased on February 20, 1883, from a real estate investment trust formed by Grenville T. W. Braman, Henry D. Hyde, and Frank W. Andrews. The parcel was one several tracts of land the trust had purchased from the Boston Water Power Company on March 1, 1872. 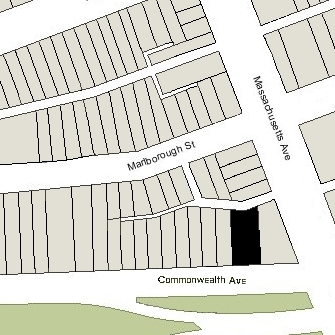 Click here for an index to the deeds for 373 Commonwealth, and click here for further information on the land west of Massachusetts Avenue between the south side of Beacon and the north side of Commonwealth. Arthur and Carrie (Lodge) Sawyer were among the first residents of 373 Commonwealth, briefly living there in 1893. They previously had lived at 91 Newbury and, before that, at 33 Gloucester. 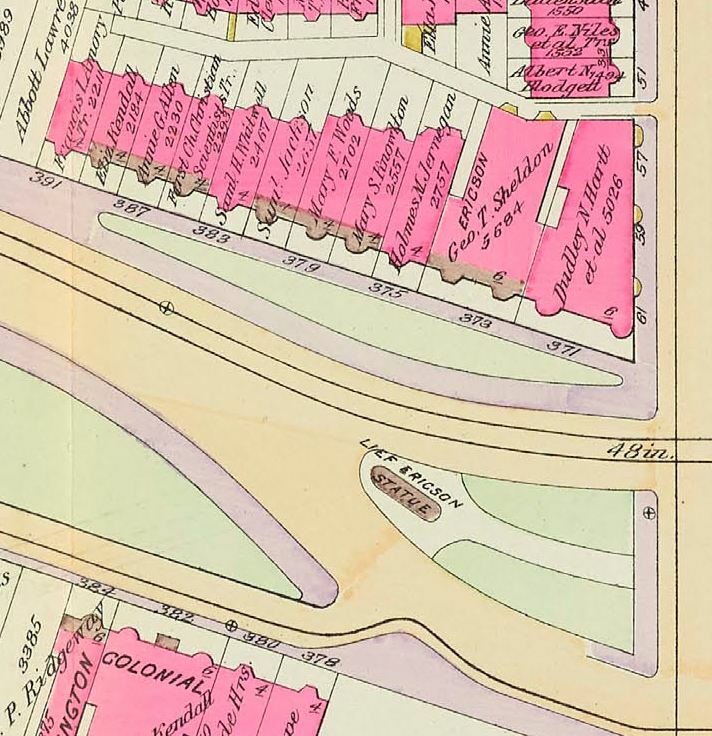 By the 1893-1894 winter season, they had moved to an apartment at 184 Commonwealth. Charles and Mary (Harmon) Hellier also lived at 373 Commonwealth from about 1894. They previously had lived at 285 West Chester Park. They continued to live there during the 1897-1898 winter season, but moved thereafter to 31 Hereford. William Richardson and Sara (Hanks) Richardson lived in Cambridge. He resigned as trustee and Henry S. Mackay was appointed in his place on November 7, 1894. Henry S. Mackay and Robena (Mackay) Mackay lived at 373 Commonwealth during the 1894-1895 winter season, while he was designing the Hotel Empire at 333 Commonwealth, which he and his partner, Charles B. Dunham, also owned. The Mackays moved to 333 Commonwealth when it was completed. On May 19/21, 1894, 373 Commonwealth was acquired from the Hotel Ericson Trust by Henry S. Mackay, with his partner, Charles Dunham, acting as conveyancer of the property. On May 22, 1894, 373 Commonwealth was acquired from Henry S. Mackay by George Thomas Sheldon, treasurer of the Chemlsford Foundry Company. He and his wife, Julia Louisa (Ripley) Sheldon, lived in Chelmsford. Julia Sheldon died in May of 1896 and George Sheldon died in January of 1903. 373 Commonwealth was inherited by their two sons, George Herbert Sheldon and Royal Ripley Sheldon. William Rice was a boot and shoe manufacturer and real estate dealer. He and his wife, Emma Louise (Cunningham) Rice, lived in Quincy. In 1908, he would build The Puritan at 390 Commonwealth. 373-393 Commonwealth (ca. 1905), © The Mary Baker Eddy Collection; used with permission. William Rice died in May of 1909. 373 Commonwealth continued to be owned by his estate. On December 31, 1920, 373 Commonwealth was acquired from William Rice’s estate by the Avenue Real Estate Trust, the shares of which were owned almost entirely by the Rice family, in exchange for 400 shares of the trust’s stock. The trust also owned the Hotel Puritan. The trustees of the Avenue Real Estate Trust were the same as the trustees under William Rice’s will: his two sons, Harry L. Rice and Frederic Ball Rice, and John D. Hardy. On February 1, 1924, 373 Commonwealth was acquired from the Avenue Real Estate Trust by Mary M. O’Brien, who conveyed it on March 1, 1924, to real estate dealer William N. Ambler who, in turn, conveyed it on March 4, 1824, to real estate dealer Edward J. Ball. On February 10, 1928, the Cape Ann Savings Bank foreclosed on a mortgage it held on 373 Commonwealth and took possession of the property. On May 7, 1928, 373 Commonwealth was acquired by Harry Seymour Ross, dean of the Emerson College of Oratory, located at 30 Huntington. On October 28, 1928, he transferred the property to the College, which operated it as a dormitory. 373 Commonwealth remained an Emerson College dormitory until about 1960. On June 28, 1960, 373 Commonwealth was acquired from Emerson College by the Bentley School of Accounting and Finance (later Bentley College), located at 921 Boylston. It operated 373 Commonwealth as a men’s dormitory and dining room. On June 14, 1968, 373 Commonwealth was acquired from Bentley College by Chamberlayne School and Chamberlayne Junior College. It continued to use the property as a dormitory and dining room. On April 26, 1974, 373 Commonwealth was acquired from Chamberlayne by Julius R. Cavadi, trustee of the 373 Commonwealth Avenue Realty Trust. In May of 1974, he applied for (and subsequently received) permission to convert the property from a lodging house into 24 apartments. 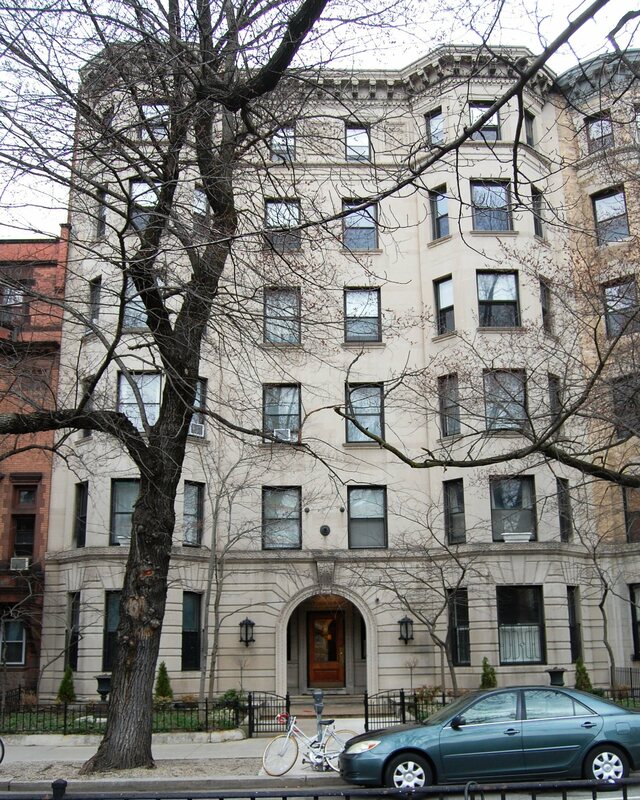 On May 25, 1978, Lester Werman and his siblings (Mark Werman, Ralph Werman, and Inez (Werman) Levenson, the wife of Moses I. Levenson) foreclosed on a mortgage given by Julius Cavadi and took possession of the property. On August 2, 1978, 373 Commonwealth was purchased from the Werman family by Glen G. Grant, trustee of the Commonwealth College Trust. On July 2, 1981, 373 Commonwealth was acquired from Glen Grant by the Erickson Development Corporation (Kendall Coffin, president; Dorothy Wirth, treasurer). On September 30, 1981, it converted the property into 24 condominium units, the Erickson Condominium.